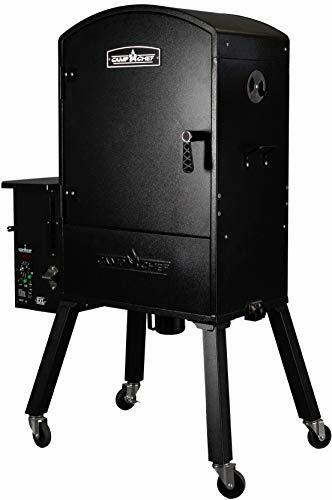 If you are looking for a wood pellet grill or wood pellet smoker, then you have likely noticed the flood of choices on the market today. They all work on the same principles where manufactured pellets created as a byproduct of hardwood processing, are slowly fed into an internal fire pot that burns slowly. The heat and smoke are then sent through the primary cooking chamber to cook the food. Most wood pellet grills have a barrel-style body that gives them more of that classic “Grill” look. Camp Chef already offers a high-quality wood pellet grill like this. Yet that wasn’t enough to appeal to this niche. Especially when you consider the large numbers of loyal customers, they have who love to smoke meat including homemade sausages, hams, slab bacon, and fish fillets. 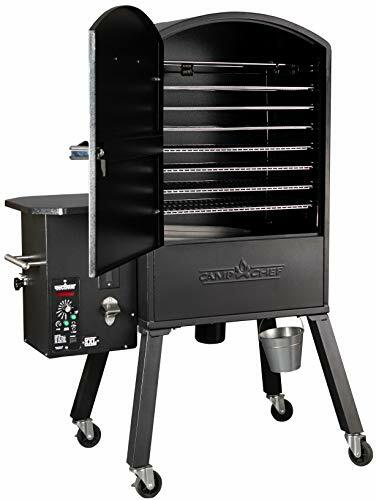 The Camp Chef PGVXXL was designed as a vertical pellet grill and smoker. It has all the things you expect in a wood pellet grill, with the hopper, auger, firepot, and internal fan. Everything is operated by the same kind of accurate controls that you find in their other models. Where it varies is in the vertical smoke chamber, and the ability to handle lower smoke temperatures. It comes with 4 grill grates as well as 3 jerky racks and a single hanging rack with 12 sausage hooks. The controls are also integrated with two temperature probes. There is also a reusable drippings cup that serves as the end of a well-designed grease management system. The Camp Chef PGVXXL also has the same Smart Smoke Technology that you find in their other wood pellet grills. This is designed to improve the overall efficiency of wood pellet consumption, while also improving heat control. It also has an 18-pound capacity hopper. Camp Chef does their best to hang their hat on quality materials. They understand just how much this means to customer loyalty, and you see this throughout the PGVXXL. 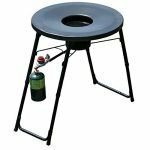 The majority of this smoker is made from 16-gauge steel, with a durable powder coat layer. This is pretty much on par with competitor grills in this price range. Some wood pellet grills leave you feeling like you need an engineering degree from page one of the assembly instructions. The Camp Chef PGVXXL is perhaps the easiest of all these to assemble. With some basic tools and a little mechanical skill, you should be able to fully assemble it in a little over an hour. Wood pellet grills are typically prized for their versatility. This holds true with the Camp Chef PGVXXL. The vertical smoking chamber, however, provides much more cooking space. 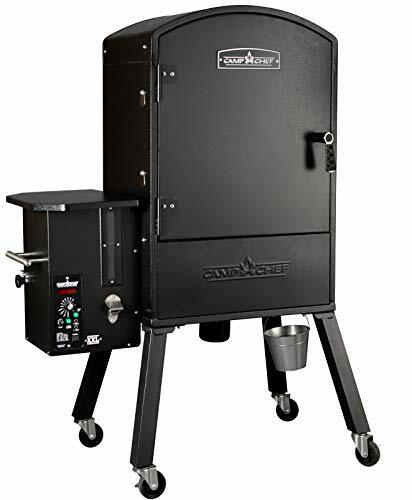 When paired with the Smart Smoke Technology, it allows you to dial in the temperature and smoke density to prepare things that you might not be able to do with other wood pellet smokers. If you hunt and process your own wild game, or you are just a fan of making your own jerky and other smoked meats, then you might want to give preference to the Camp Chef PGVXXL. 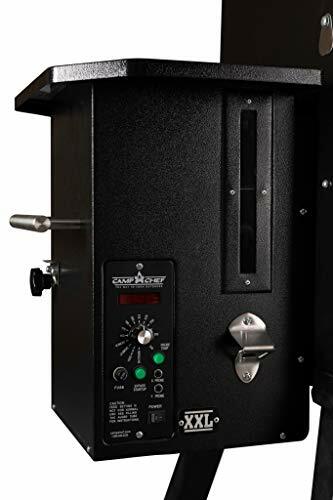 The higher capacity and the fact that it can get down to 150-degrees allows you to do things like smoke slabs of bacon, smoke your own fresh sausage, and even prepare wonderfully smoky beef jerky. If you are a fisherman or lover of smoked seafood, the Camp Chef PGVXXL can smoke fillets of salmon and trout, as well as do things like smoke shell-on shrimp. Yet it isn’t just a smoker means to handle so-called “Cold Smoke” foods. The temperature can be turned up all the way to 300 degrees to produce hot smoked barbecue. In this setup, it can hold up to four flat briskets in the 10 to 12-pound range. With some careful placement, you might also be able to smoke five or possibly six pork shoulders, or eight butterflied chickens. 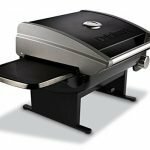 The 300-degree maximum high temperature is indeed a little lower than the max temp you see with a lot of other wood pellet grills in this price range. This is due in part to the overall internal volume as well as the external surface area of the smoking chamber, and the potential impact of the weather. In cold or very windy conditions the Camp Chef PGVXXL might consume more wood pellets than you prefer, as the Smart Smoke Technology attempts to keep up with heat loss. The Camp Chef PGVXXL comes with 4 grill grates as well as 3 jerky racks and a single hanging rack with 12 sausage hooks. When you install it just right it can provide you with up to 2,400 square inches of smoking space. The Smart Smoke Technology improves overall efficiency and wood pellet consumption, in all but cold or windy weather. The additional grates, including the three jerky racks, help maximize the internal volume of the vertical smoke chamber. 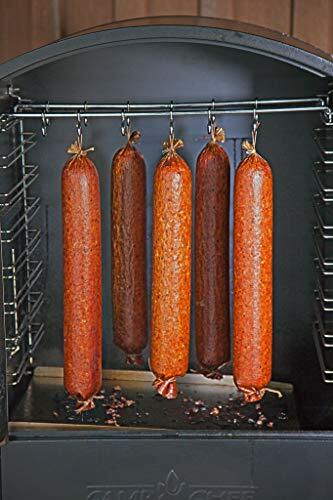 The hanging rack that allows you to make linked, ring, and other types of hanging smoked sausage is something you don’t find in barrel-style wood pellet grills, and it’s not always included even in vertical charcoal smokers. The two temperature probes is a single step above most of the competition who only offer one. The grease management system and ash cleanout system are pretty much standard on all wood pellet grills. This really speeds the cleanup. If you are going to be smoking a large volume of meat for a long period of time, you will want to keep an eye on the drippings cup, in case it starts to overflow. Since this is meant to be more of a smoker than a grill, the grates aren’t enameled with porcelain or another non-stick material. This means you are going to do a fair amount of scraping after a long smoking session. The Camp Chef PGVXXL comes with a 3-year warranty. This only applies to the original purchaser and requires you to register the date of purchase, as well as present the receipt. 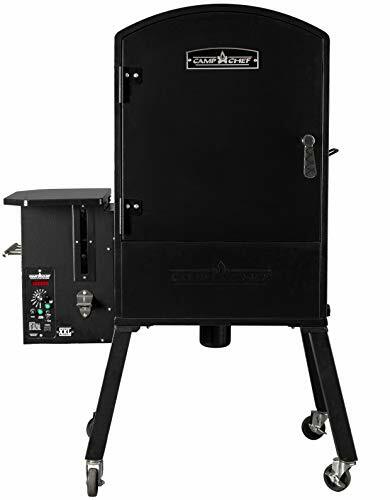 If you are looking for a wood pellet grill that can be used as a high-volume smoker, capable of so-called “Cold Smoking,” then the Camp Chef PGVXXL should be a top contender. It does everything you want in a smoker cabinet, while also providing you with the “Set it and Forget it” that is so attractive with wood pellet grills. Just keep in mind that its temperature range cannot go over 300-degrees. It might also burn through more wood pellets than you’d like if you are smoking on a particularly cold or windy day.